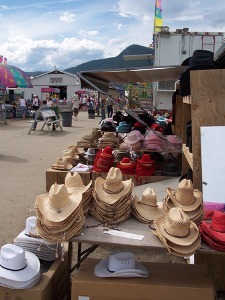 The Interior Provincial Exhibition and Stampede in Armstrong B.C. 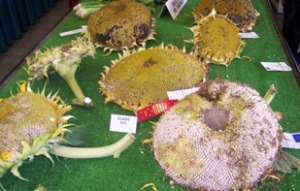 continues to grow in size and popularity as they open for their 106th year. Born out of early settler lives and traditions, the fair of today offers a glimpse for the rest of us into an early lifestyle without television, video games, and cell-phones. 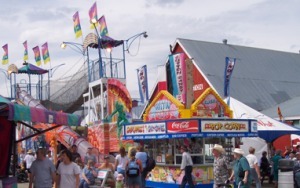 There is the entertainment, from music, rodeo, midway rides and games, food, displays etc. Every year at the end of summer, people come together in a traditional celebration of harvest, livestock, and crafts from the farm. Farms sent in their biggest and best, in this case, monster sunflowers. 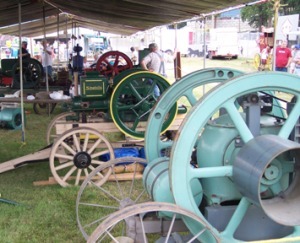 Large flywheels dominate the early versions of typical engines found on the farm. 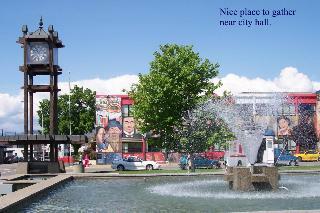 From biggest pumpkin, best homemade wine, baking goods, preserves etc. to prize-winning livestock, you will find a very long list of what came from the efforts of farm life. 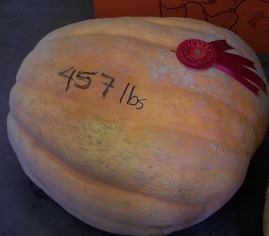 One very large pumpkin (208kg), and my favourite kind of pie ! This event is a "must-see" for those wanting to experience Canadian rural life at its best.